David C. Bell was born in Lincolnshire, not far from the River Humber. After attending Trinity House Navigation School, Hull, David embarked upon a career at sea in the Merchant Navy. 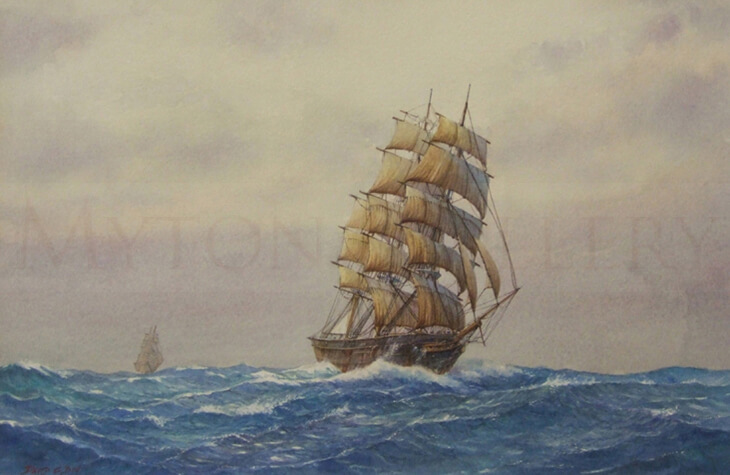 After nine years sailing around the world as a ships navigator, and having spent time at sea drawing and painting, David felt his true course in life was to paint full time, so he left the sea to become an art student. After gaining a B.A. in Art, David set about fulfilling his ambition as a marine artist. Successful exhibitions followed and he has produced several books of his works, all reflecting his deep interest in maritime history. Working in watercolours, David’s evocative and atmospheric pictures of trawlers from Hull’s fishing industry heyday and river humber paddle steam ferries sit alongside scenes of fishing villages and towns along the east and north Yorkshire coastline, with Whitby and Staithes being particular favourites. One of his books 'A Nautical Odyssey - An Illustrated Maritime History’ tracks, through the author’s artwork, some of the key moments in Britain’s maritme history from 1768 to 1916, from James Cook and his ship the Endeavour and then moves through 150 years to Shackleton and the Endurance. David’s paintings are in private collections throughout the world, with ‘The Sir Walter Raleigh’ in the possession of H.R.H. Prince of Wales, and a river humber scene ‘Humber Heritage’ in the collection of H.M. The Queen.